Natural disasters as acts of God – or gods. Around 14000 years ago, where there were some adjoining islands in the Nile Delta, trading took place and became established until the city of Thonis-Heracleion was gradually built, intersected by canals. It had a number of harbors and anchorages and was the sister city of Naucratis until it was superseded by Alexandria. It was at the mouth of the Nile as it enters the Mediterranean. The earth beneath the major temples actually turned to liquid, thanks to a geological process called liquefaction, and most of the city’s glittering buildings and statues went spiralling down to the bottom of the sea. 4 years ago, French layman archaeologist (but whose main profession was maths and statistics) Dr Franck Goddio used his ability in maths to guide his enthusiasm to search for the lost city of myths and legends. It took years of work, raising funds, gathering the expertise around him, but eventually this discovery, perhaps the most amazing of the 21st century, was discovered and the artefacts brought to the surface for us all to see. At the time, a German film crew made a documentary which can be seen on YouTube. At its heart was a huge temple to the god Amun-Gereb, the supreme god of the Egyptians at the time. From this stretched a vast network of canals and channels, which allowed the city to become the most important port in the Mediterranean at the time. Heracleion, named for Hercules, who legend claimed had been there. It was also mentioned fleetingly in ancient texts. Submerged under 150 feet of water, the site sits in what is now the Bay of Aboukir. By the 8th Century BC, upon the highest part, Thonis-Heraclion was built and commanded major trading around the Mediterranean. When divers began sifting down through the thick layers of sand and mud, they could barely believe what they found. “The archaeological evidence is simply overwhelming,” said Professor Sir Barry Cunliffe, an archaeologist at the University of Oxford has also been taking part in the excavation. The researchers now also hope that they may even find some sarcophagi used to bury humans in some of the outlying areas around the sunken city. “The discoveries enhance the importance of the specific location of the city standing at the ‘Mouth of the Sea of the Greek’,” said Dr Goddio, who has led the excavation. This earthquake had far reaching consequences and destroyed much of the city state of Sparta. It has been estimated that the quake and its after effects may have killed as many as 20,000 people and it sparked the revolt of the Helots. This revolt led to a breakdown of a treaty between Sparta and Athens which led directly to the First Peloponnesian War. The events that have survived in the writings of Strabo, Pausanias, Plutarch and Thucydides are attributed various reliability and thus it has been difficult to pinpoint the exact epicenter and magnitude associated with the quake. The earthquake contributed to a growing distrust between Sparta and Athens. Thucydides, the ancient Greek chronicler of the Peloponnesian War, reported that a number of Greek city-states sent troops to help put down the rebellion of helots in Sparta. Athens sent approximately 4,000 hoplites under the leadership of Cimon, but this contingent was sent back to Athens, while those from other cities were allowed to stay. According to Thucydides, the Spartans were concerned that the Athenians would switch sides and assist the helots. The Athenians were insulted, and therefore repudiated their alliance with Sparta. Once the uprising was put down, some of the surviving rebels fled to Athens, which settled them at Naupactus on the strategically important Corinthian Gulf. The alliance would never be revived, as disagreements between Sparta and Athens would continue to intensify until the outbreak of war in 460 BC. Given that the Helot population seized upon the earthquake to rebel against the Spartans, the Spartans reformed their society after the Helots were subdued, becoming extremely austere. The Spartan area of Greece has been subject to many recent earthquakes including the 2008 Peloponnese earthquake located less than 50km from the 464 BC area of most destruction. Seismically, Greece sits on the plate boundaries of the Eurasia, Africa and Arabia plates which have produced still smaller micro-plates that sit under Greece. It is likely that a strike/slip fault, which has east-trending and northeast-trending zones of deformation and which moves at the rate of about 30mm per year was the cause of the Sparta quake. As an addendum to this earthquake during the later Peloponnesian Wars the Greek historian Thucydides described a tsunami that occurred in 426 BC, and he was the first to associate the cause of a tsunami with an earthquake in a written account. The epicenter of this quake is as yet undiscovered, however evidence points at a crustal movement along one of the faults in the Euboean gulf, rather than submarine landslides, thus Thucydides conjecture via his research into the cause of the tsunami shows remarkable intuition given that he was not party to the actual quake responsible. I grew up reading children’s books of Greek legends, which were so gripping and exciting. That wonder of those mighty gods worshipped by the Mediterranean peoples, carried me into a fantasy world away from the blackened, sooty city of Leeds where I was growing up. Watching this YouTube of this discovery had the same affect on me, though now I live in a magical place myself, the Scottish Borders. When the city of Thonis-Heracleion was built, there was obviously a belief that here was site of plenty. All cities try to define themselves as trading centres, wealth creators, seats of power, with bountiful food and water. But all are destined to crumble to dust, or be submerged by rising waters, tsunamis and the like. 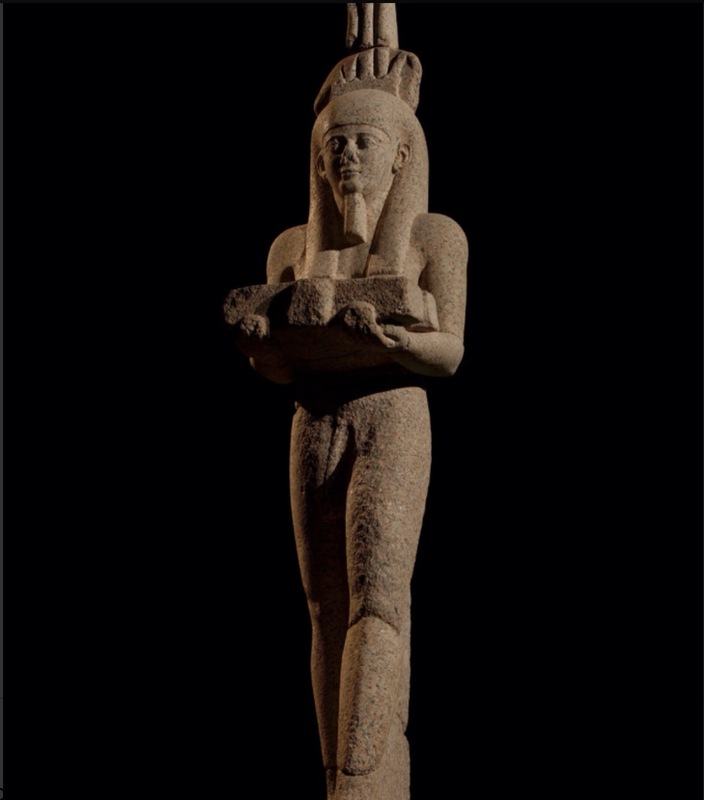 The statue of Hapi, (Hep, Hap Hapy) the god of the annual flooding of the Nile in ancient Egyptian religion, dominated the city. The flood deposited rich silt (fertile soil) on the river’s banks, allowing the Egyptians to grow crops. Hapi was greatly celebrated among the Egyptians. Some of the titles of Hapi were, Lord of the Fish and Birds of the Marshes and Lord of the River Bringing Vegetation. Hapi is typically depicted as an intersex person with a large belly and pendulous breasts, wearing a loincloth and ceremonial false beard. As Thonis-Heracleion slipped beneath the waves, religious beliefs were shifting and becoming entwined with warrior land grabs which intensified the motivation of fanatical believers to confront and discard those who rejected the ‘new’ beliefs backed by armies. When Christianity and Islam were growing religions, the worship of those gods was gradually perceived as a sin against the one God, but the logic of Paganism still permeates many cultures who respect the power of nature and how dependent humans are on the processes which keep us alive. The progress of the post Mohammad Islamic Arabisation can be traced through the 5th to 8th century Empires of countries close to Arabia. Iran (then Persia): The Persian Empire is one of a series of imperial dynasties centered in Persia (modern–day Iran). The first of these was the Achaemenid Empire established by Cyrus the Great in 550 BC with the conquest of Median, Lydian and Babylonian empires. It covered much of the Ancient world when it was conquered by Alexander the Great. Several later dynasties “claimed to be heirs of the Achaemenids”. Persia was then ruled by the Parthian Empire which supplanted the Hellenistic Seleucid Empire, and then by the Sassanian Empire which ruled up until the mid-7th century. While many of these empires referred to themselves as Persian, they were often ruled by ethnic Medes, Babylonians, or Parthians. Iranian dynastic history was interrupted by the Arab conquest of Persia in 651 AD, establishing the even larger Islamic caliphate, and later by the Mongol invasion. In 644 Umar (second of the Rashidun caliphate after the death of Muhammad in 632) was assassinated by Persians in response to the conquest of their empire and was succeeded by Uthman, from the Banu Umayya clan, who was elected by a six-person committee arranged by Umar. Under Uthman, the empire’s conquest of Armenia began by the 640s, and the empire expanded into Fars (present-day southwestern Iran) in 650 and some areas of Khorasan (present-day northwestern Afghanistan) in 651. The Greek world was an ever-changing geographical reality throughout three million years before Christ. The first settlements in the Cyclades and Crete and later on both sides of the Aegean Sea, colonization along the Mediterranean coast and around the Black Sea, the immense empire created by Alexander the Great. Divided by internal dissension, the Hellenistic world was gradually absorbed into the Roman Empire, though Greek culture continued to develop throughout the Mediterranean Basin. The Byzantine Empire, also referred to as the Eastern Roman Empire, was the continuation of the Roman Empire in the East during Late Antiquity and the Middle Ages, when its capital city was Constantinople (modern-day Istanbul, which had been founded as Byzantium). It survived the fragmentation and fall of the Western Roman Empire in the 5th century AD and continued to exist for an additional thousand years until it fell to the Ottoman Turks in 1453. During most of its existence, the empire was the most powerful economic, cultural, and military force in Europe. Both “Byzantine Empire” and “Eastern Roman Empire” are historiographical terms created after the end of the realm; its citizens continued to refer to their empire as the Roman Empire (Greek: Βασιλεία τῶν Ῥωμαίων, tr. Basileia tôn Rhōmaiōn; Latin: Imperium Romanum), or Romania (Ῥωμανία), and to themselves as “Romans”. Over the Mediterranean it was 3150 BCE when the First Dynasty appeared in Egypt with the unification of Upper and Lower Egypt by the king Menes (now believed to be Narmer). 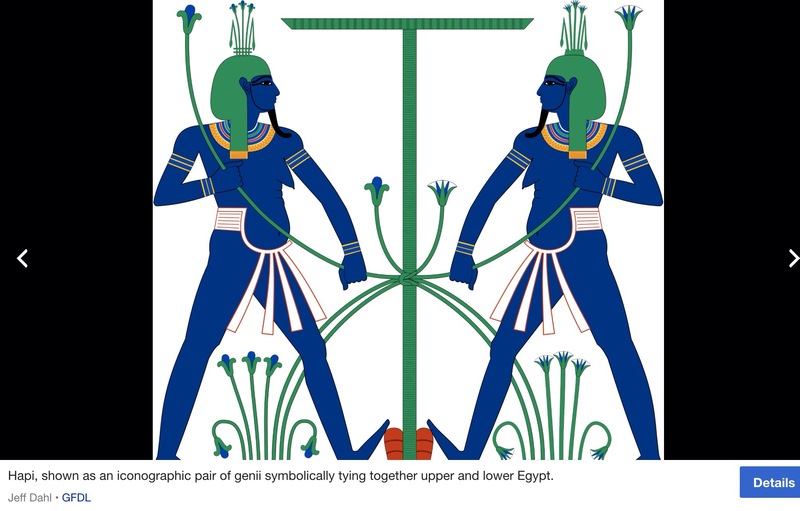 Menes/Narmer is depicted on inscriptions wearing the two crowns of Egypt, signifying unification, and his reign was thought to be in accordance with the will of the gods; but the office of the king itself was not associated with the divine until later. During the Second Dynasty of Egypt (2890-2670 BCE) King Raneb (also known as Nebra) linked his name with the divine and his reign with the will of the gods. Following Raneb, the rulers of the later dynasties were equated with the gods and with the duties and obligations due those gods. As supreme ruler of the people, the pharaoh was considered a god on earth, the intermediary between the gods and the people, and when he died, he was thought to become Osiris, the god of the dead. As such, in his role of ‘High Priest of Every Temple’, it was the pharaoh’s duty to build great temples and monuments celebrating his own achievements and paying homage to the gods of the land. Additionally, the pharaoh would officiate at religious ceremonies, choose the sites of temples and decree what work would be done (although he could not choose priests and very rarely took part in the design of a temple). As ‘Lord of the Two Lands’ the pharaoh made the laws, owned all the land in Egypt, collected taxes, and made war or defended the country against aggression. In 656 Uthman (third leader of the Rashidun caliphate since Muhammad) was assassinated by Egyptian rebels. Ali, husband of Muhammad’s daughter, Fatima – ineligIble due to her gender, was receiving vigorous support from various rebel groups. He accepted appointment as the next caliph. A member of the same clan as Muhammad, Banu Hashim, presided over a civil war known as the First Fitna (656–661). The war was primarily between those who believed Uthman was unlawfully killed, supporting his cousin and governor of the Levant Muawiyah, and those who believed his killing was deserved, supporting the caliph Ali. The civil war permanently consolidated the divide between Sunni and Shia Muslims, with Shia Muslims believing Ali to be the first rightful caliph and Imam after Muhammad, favouring his bloodline connection to Muhammad. Additionally, a third faction in the war believed both Ali and Muawiyah should be deposed and a new caliph elected by shura; this faction supported the governor of Egypt Amr ibn al-As. The war lead to the end of the Rashidun Caliphate and the establishment of the Umayyad Caliphate in 661, under former governor of the Levant Muawiyah 1. My view is that, as scattered numbers of hunter gatherers grew in size, became tribes with leaders, prepared to fight for their perceived homelands, drew on their pagan beliefs for strength in war, they formed alliances with likeminded tribes, probably through established trading. Over thousands of years, some alliances were more sophisticated than others and they would overwhelm less organised populations. Leaders would inspire followers with their religious beliefs and warrior prowess. This seems to be an evolving human strategy, but natural disasters could be interpreted by opinion leaders as a way forward to seek revenge and blame an old enemy for the calamity. Since Christianity spread, so did Islam as dominant beliefs, though other cultures around the world held beliefs of their own until such time as they might be overwhelmed by those expanding their empires. But empires have grown and faded, nations have become hegemonic through cultural persuasion, strong trade, military activity and building of military bases globally. But we all know nothing lasts forever. Retired, living in the Scottish Borders after living most of my life in cities in England. I can now indulge my interest in all aspects of living close to nature in a wild landscape. I live on what was once the Iapetus Ocean which took millions of years to travel from the Southern Hemisphere to here in the Northern Hemisphere. That set me thinking and questioning and seeking answers. This entry was posted in Uncategorized and tagged arabia, christianity, egypt, gods, greece, idols, islam, mediterranean, Muhammad, natural disasters, paganism, Persia, power, Thonis-Heracleion, trade. Bookmark the permalink.